Like that team a lot? Go to a bunch of games? Call yourself a big fan? 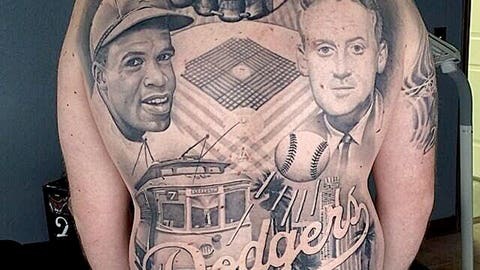 We’re guessing you’re not as big of a fan of your team as this guy is of his team – the Dodgers. Now that’s a piece of art. Notice Jackie Robinson, a very young Vin Scully (nice touch), and the trolley from the team’s Brooklyn days. That must have taken a few hours to complete.